I’ve been perfecting this for a long time. First you should get real oats. NOT the “instant” oats. Instant oats are chopped-up mush. What you want are the real oats. Oats that are full, unadulterated oats. Quaker Old-Fashioned Oats are just fine, as are other oat brands. When it’s all said and done, they’re just oats. Pour some into your bowl. The amount you want to eat. Now it’s time to add the liquid. “What kind of liquid?” Only you can answer this question. I can tell you what I like, but I’m not you, and I never will be. Use the liquid that’s right for you. Flavor is what you’re looking for. Whole milk? You might say that’s the gold standard of creaminess. Use 100 percent whole milk for a solid, creamy taste. At the other end of the spectrum, you have the option of water. Use 100 percent water for a taste that is absolutely devoid of creaminess. That one’s for the oat purists only—you can really taste the oats there. If you’re torn, what you want to do is use a little mix. Half milk, half water. Want to simplify? Use 100 percent skim milk. That’s basically milk and water together anyhow. As your taste in oatmeal becomes more refined, you can alter the milk/water ration to your liking. Some people might want 80 percent milk, 20 percent water for a creamy taste with a smooth edge. Others might want 20 percent milk, 80 percent water for an oat taste with just a hint of milkiness. Again, only you can decide definitively what you prefer. Think of your choice of liquid as a dial that you can turn to match your preferred taste on a spectrum running from “Creamy” to “Oat-y.” As you practice, your favorite setting will become clear, and you’ll know just what kind of liquid to use. You can also use almond milk if you like your creaminess with a little twist of almondine. This is good, too. Mix it up and experiment. You’ll have a bowl of oatmeal no matter what, so even if you find that the liquid mix is not ultimately the exact way you would like it, just take it as a learning experience. You’ll get closer to perfection next time. 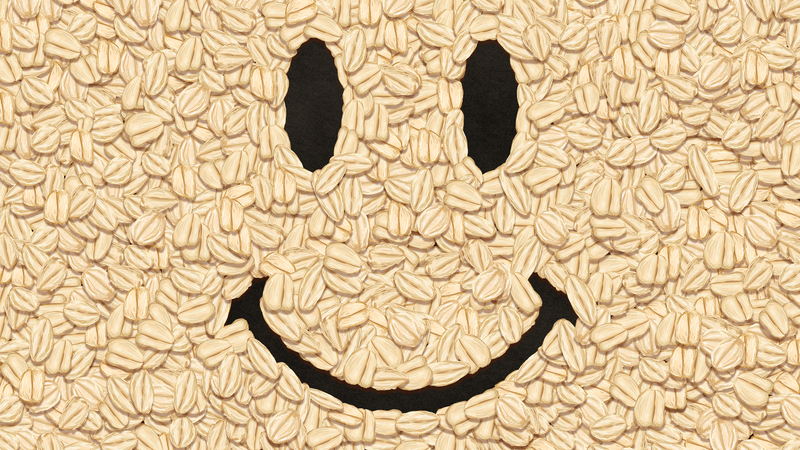 In the meantime, you’ve got some decent oatmeal as your consolation prize. Put enough liquid in the bowl to JUST cover the oats. If you put too little, you’ll end up with dry oats. If you put too much, you’ll be microwaving that mother all day. Take your bowl and put it in the microwave. Set the microwave for three minutes and hit start. If you want to walk away and do something else, that’s fine, but only for the first minute or so. After that you need to be watching the oatmeal. Every microwave is different. Some are weak. Others are very powerful. Microwaves are like humanity. Either way, you have to keep an eye on them. After a minute and a half, as long as you haven’t put in too much liquid, a very powerful microwave may have nearly cooked your oatmeal. You’ll be able to tell because it starts to form a bubble on the oatmeal surface. You will see the heated, fully cooked oats at the bottom of the bowl begin to bubble up on the surface. With each passing second, the bubble with grow larger and larger. If you were to allow the oatmeal to continue cooking indefinitely, the size of the oatmeal bubble would eventually exceed the height of the bowl, escaping and splattering over. You need to hit “stop” on the microwave before that happens. After much trial and error with this, you will get a good sense of your microwave, and you’ll be able to put the oatmeal in to cook for the exact amount of time that it takes for that bubble to form as high as the top of bowl, but no longer. Take it out and stir the oatmeal. You may find that the top layer of oatmeal, which comprised the visible part of the rising bubble during the cooking process, is fully cooked, but that underneath there is still a less cooked layer of oatmeal with ample amounts of sloshing liquid. If that is the case, give it a good stir and put it right back in for a minute. When it bubbles up again, pull it out. Stir. Check the liquidity. Repeat this process until it becomes clear that the oatmeal is fully cooked. You want the consistency of a nice porridge. The individual oats will be discrete units, obviously, but you want them in a paste-like binding of hot, congealed liquid. Watery oatmeal isn’t worth a damn. Cook it until it’s thick enough to hold a G.I. Joe figurine posed to look like he was sinking in “quicksand,” which in this case is in fact oatmeal. Want to add some toppings? You can. It would be more accurate to call them mix-ins. A bowl of oatmeal should have a common consistency, whether it’s pure oats or oatmeal mixed with things, so you don’t want to just set things on top. You want to mix them in. Again, your choice of mix-ins will depend on your own personal taste. But I can start you off with some recommendations: walnuts, pecans, raisins, cranberries, blueberries, bananas, honey. I wouldn’t recommend all of these mix-ins at once. Think of it more as a menu from which you can choose. Some combinations I’ve found to be enjoyable include: Walnut/ Banana; Walnut/ Raisin; Walnut/ Cranberry; Pecan/ Blueberry; Walnut/ Honey; Pecan/ Honey; Walnut/ Banana/ Honey; or Blueberry (only). I don’t recommend mixing a sweetener such as honey in with a mix-in that itself contains significant amounts of sugar, such as raisins. I find that’s just too sweet for my taste. Overpowering the taste of the underlying oatmeal that you’ve worked so hard to perfect isn’t desirable. At times in my life I have experimented with placing a scoop of Greek yogurt on top of the oatmeal. It gives you a good hot-and-cold contrast. Some may find this to be too much creaminess in a single bowl, particularly if you’ve used a high percentage of whole milk for your liquid. I’d leave this option to advanced users only. It’s something to keep in mind, though, when you feel you want to take things a little farther. If your oatmeal is too hot, blow on it. Then eat it while it’s warm. When you’re done, put the bowl in the sink and fill it with water. Let it soak like that and you won’t have dried oats stuck to the inside of the bowl when it’s time to wash it. You’ll be able to clean the bowl easily and put it right back into the cabinet—until it’s time for your next bowl of oatmeal. I have a feeling it won’t be too long.